It’s been a busy time here at Go Stay Work Play Live World Headquarters aboard the Lucky Nickel. 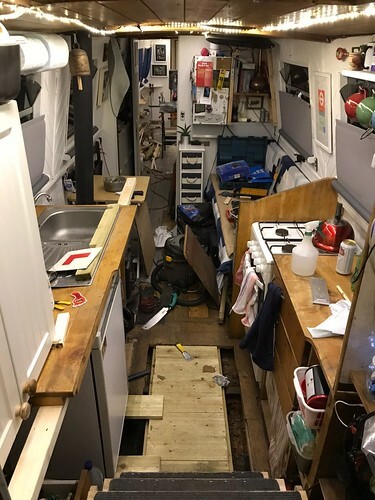 For the last month I’ve been doing some quite extensive interior renovations on the boat, which has taken up 99.4% of my time and energy. I’m quite pleased with how it’s all going, and will unveil the results in a post soon. 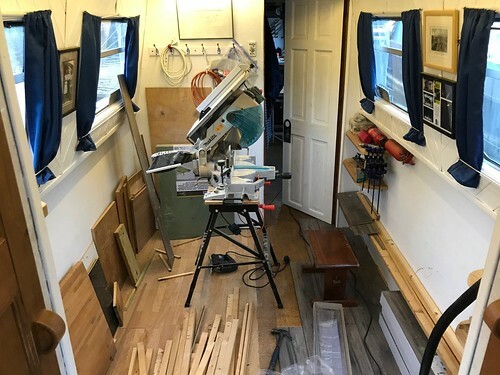 However, even the most committed renovator (and I am certainly not the most committed renovator) needs a day off every once in a while, especially when living in the same 200 square foot space one is renovating (the logistics… oy!). 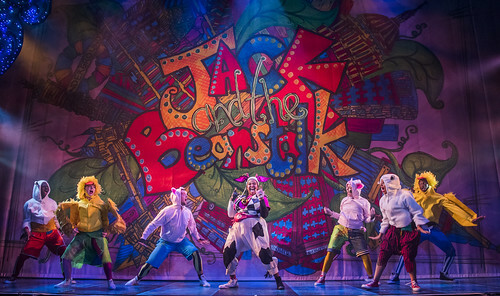 So I was very pleased to take up an invitation from my friend Piran who’s a regular blog reader and a Jedi Master in the field of Quirky London Things To Do. When Piran invited me out to see a mysterious, recently opened “cog and gear (kinda) museum", followed by more fantastical machines at another mystery location, I happily hung up my tape measure and blew the sawdust out of my hair to meet him at Pinner Station, not sure of what to expect but primed for a Grand Day Out. I think I may have done an involuntary “happy clap hands” sort of gesture when I saw this sign. And of course I was entirely right. Heath Robinson was an illustrator and cartoonist born in 1872 in London (Finsbury Park). As I said in the glossary, he’s best know for his drawings of absurdly complicated devices designed to achieve simple tasks. 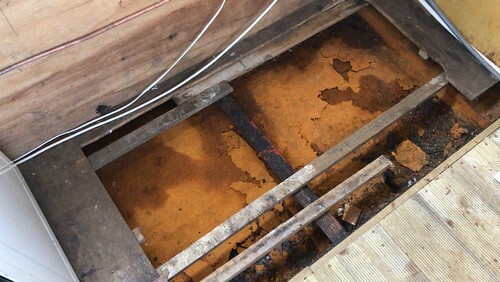 They generally involve a lot of pulleys and bits of knotted string, and are surrounded by chubby bald men in overalls who tend the machines with great solemnity. 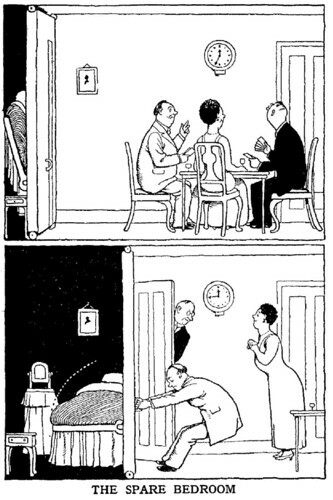 There are, however, two things I didn’t realise about Heath Robinson. First, I didn’t know that aside from his best-known black-and-white cartoons, Robinson was a talented illustrator and a trained artist. And second, for some reason I sort of thought there would be actual machines, which in retrospect is a bit stupid. Because if you spend approximately one nanosecond properly contemplating any of Heath Robinson’s fantastic machines it becomes apparent they were never meant to leave the page. The Heath Robinson Museum (great logo!) is tiny, and it’s in Pinner because Robinson lived in a house on nearby Moss Lane. And, despite my assertion that it’s not really possible to build any of his devices, there is actually a fairly impressive Heath Robinson Device on display at the museum. This device not only cut the ribbon for the official opening of the museum in 2016 (eventually, with a guillotine-like blade on the right) it also moved the hands of a large clock and (sort of) played the Harry Potter theme tune. Or at least that was the idea. As anyone who has played Mousetrap will know, you almost always need a helping hand to get things moving somewhere along the way. One of the volunteers at the museum demonstrated the machine for us, and had to employ a few judicious nudges to keep things moving, as was the case during the official Ribbon Cutting Ceremony, depicted here. 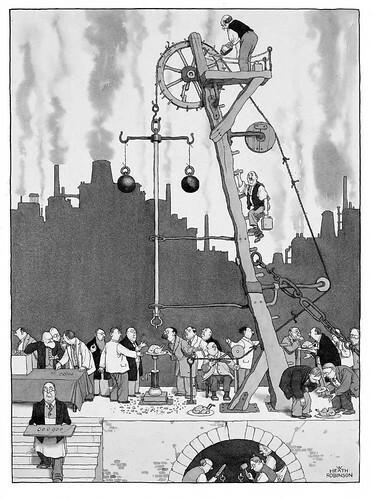 But back to Heath Robinson. 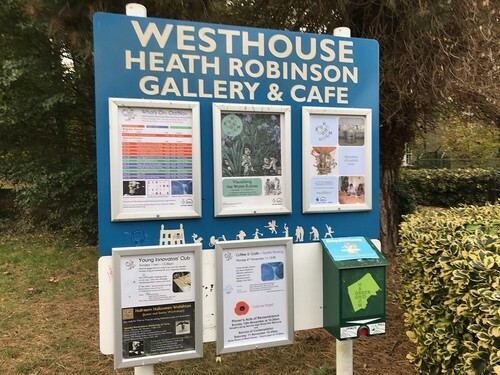 The museum is small, and displays examples of Heath Robinson’s work on the walls of one room, arranged in chronological order working through his time as an illustrator of children’s books and moving on to his very popular First World War cartoons. 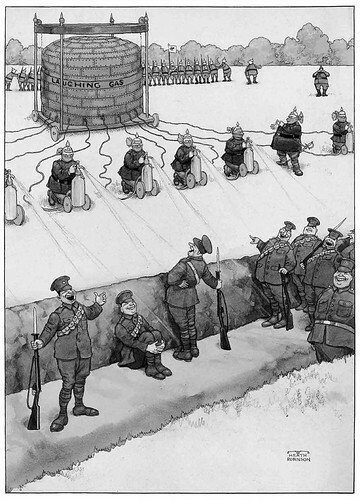 These mostly depict the Germans employing dastardly but absurd means of attack, and illustrate the sort of gentle satire that typifies Heath Robinson’s work. As Robert Endeacott said, "He took a stand against war by taking the piss out of Germany's horrendous war machinery"
"Huns Using Laughing Gas to Disable British Troops before an Attack"
It was during WWI that Robinson started drawing the outlandish machines that would literally make his name an entry in the dictionary. 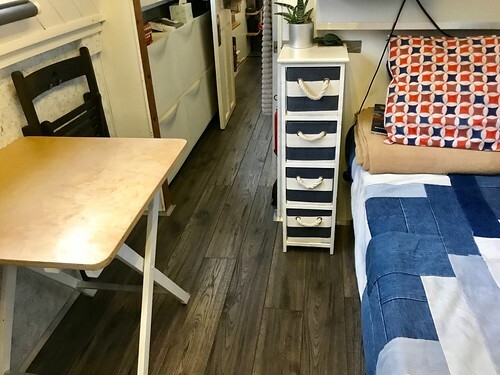 Generally poking fun at modern living, his plans for a wart removing chair, pancake flipping machine and potato peeler led on to the first in a series of “How To” books, entitled “How to Live in a Flat”. 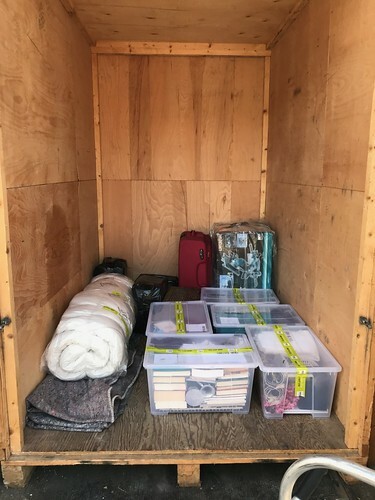 As more and more people began moving into less and less space, Robinson (as illustrator) and K. R. G. Browne (as author), presented an utterly engaging handbook for life in tiny spaces. No wonder then, that as a tiny-space-dweller myself, I snapped up my very own copy in the museum gift shop and devoured most of it on the tube ride home later that night. A sample of Browne’s sparkling prose. After a thorough examination of the permanent collection, a spin through the temporary exhibit about illustrations for the children’s classic “The Water Babies”, and a polite ransacking of the gift shop, Piran and I retired to a nearby cafe for lunch before the long trek into the centre of town for Grand Day Out, Part Two. In fact, it turned out the Part Two was a time-sensitive event, so Piran deftly directed us through an impromptu interval at Somerset House that involved an engaging video installation, and then through a very large exhibit over many many floors of an empty building on The Strand that would take a whole other blog to talk about, so let’s skip lightly over that, pausing briefly for a nice bowl of noodles, and fast forward to the next instalment of fantastic machines. Oooooohhhh… this is going to be good! 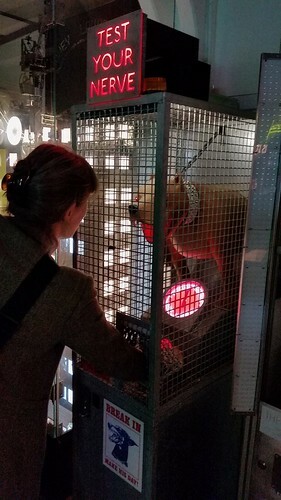 The Novelty Automation arcade is open every day, but only opens in the evenings once a month, so timing for the visit was crucial. (In the evening events they serve beer!) We arrived not long after opening and invested in a couple of drinks and a handful of tokens and then hit the machines. 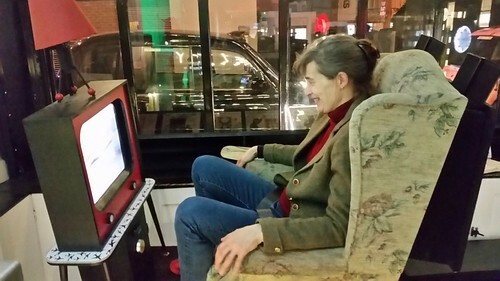 Here's me having a mini vacation, which involved sitting in an armchair while a video screen in front of me displayed a fast-forwarded trip through an airport, flight, hair-raising hotel transfer, 5 seconds of beach time and then the reverse journey, while the chair bumped and rocked along with the video. Fantastically, most of the machines there were invented and built by one guy, who was there in the shop that night. Tim Hunkin is an engineer and cartoonist who's probably best known for drawing a long-running series in the Observer called "The Rudiments of Wisdom". 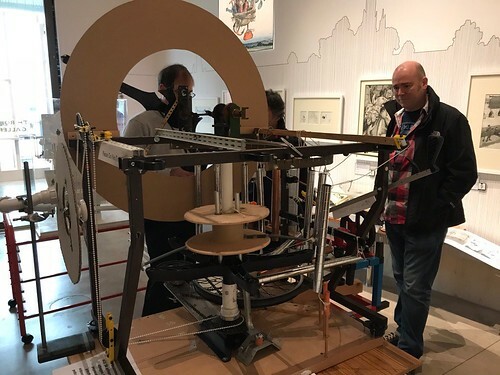 It wasn't until I started looking into Tim Hunkin to write this post that I realised how perfect the link was between our afternoon trip to see classic cartoons of fantastic machines and the evening visit to see fantastic machines made manifest by a cartooning engineer. Well played, Piran! 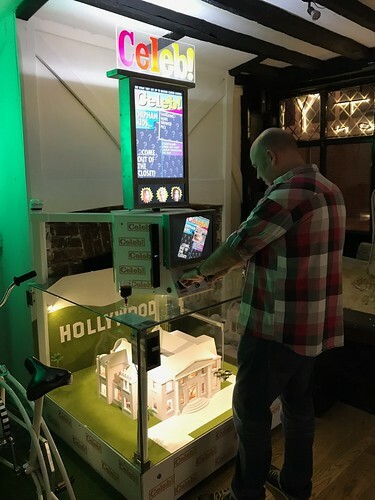 Many of Tim Hunkin's machine's had a familiarly wry bit of social commentary served up alongside the fun. For instance, "Pet or Meat" depicts a tiny papier mache family and a little lamb, and a spinning needle determines whether the lambs is... well you get the idea. And appropriately for London, there was a money-laundering game involving high-rise real estate. Along with the wry social commentary, there were some games that were just fun, and almost all had an unexpected twist. This one required you to hold onto the handle for as long as possible while the vicious dog snorts and pants and dribbles spit on your hand. It's more fun than it sounds like, really. One of the more clever machines was called i-Zombie. After placing your phone in the designated spot on the machine, you're confronted with a never-ended parade of tiny phone zombie characters endlessly advancing towards you (very clever use of the classic "Pepper's Ghost" effect). Handles allow you to move your mechanical avatar back and forth to avoid them, but eventually they speed up too much and run you over. Once you're run over and the game is done you reach down to recover your phone only to discover it's gone! I was seriously taken in by this, genuinely thinking someone had nicked my phone while I'd been totally engaged in dodging plastic zombies. Then the machine informed me I'd been judged to be an i-Zombie and it had confiscated my phone for three hours! 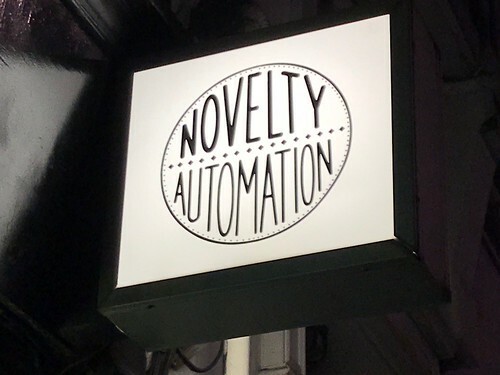 It was just the kind of unexpected twist that typified the machines at Novelty Animation. And equally typically, the machine gave me an out and produced my phone after I'd admitted to my addiction. By the time we'd had a couple of drinks and tried all the machines we were some of the last people to leave the shop. 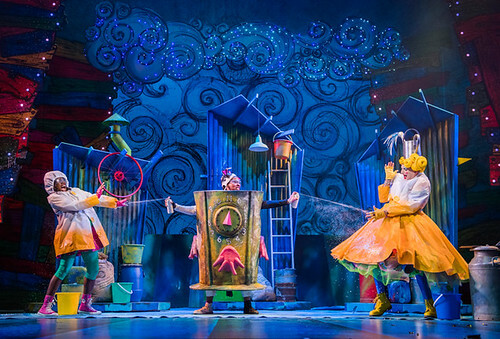 I was utterly charmed by the place, and though it had been long, the whole experience really had been a Grand Day Out which is actually very appropriate, since Wallace and Gromit certainly belong in Endearing and Eccentric Inventor's Club, alongside Heath Robinson and Tim Hunkin. All that, and we still had time for a quick pint. Perfect. Halloween has mostly caught on over here, though it’s not really an English tradition. Halloween is an import from America, like McDonald’s instead of Wimpy’s. These days it's common to see people dress up in Halloween costumes and have parties and you even get the occasional trick-or-treater. 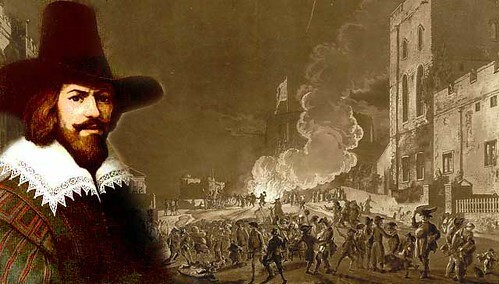 But the truly English autumnal festival is Guy Fawkes day, now generally called Bonfire Night. I’ve been here for for seven years now and finally this year, for the first time, I managed to take part in a proper bonfire for the occasion. 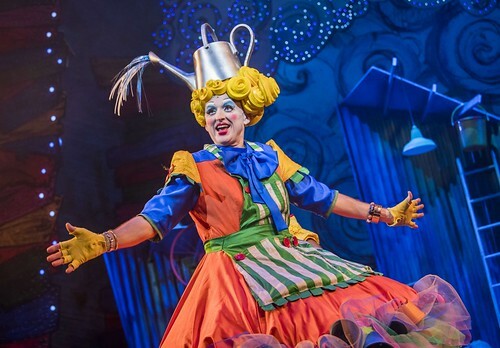 How nefarious he looks! He's also the inspiration for the Guy Fawkes mask, popularised by the movie "V for Vendetta" and those hacktivists at Anonymous. Guy Fawkes (and any conspirators who fled and survived a later battle) were put on trial, convicted and sentenced to be hung, drawn and quartered. With anti-Catholic sentiment running high, and to celebrate the foiling of the plot, parliament declared a public holiday on Nov. 5 by passing the catchily named “Observance of 5th of November Act” (see what you can do with that one, Hallmark!). 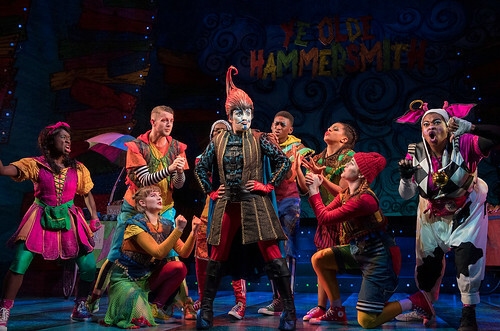 As you might guess from their origins, the celebrations historically had a strong anti-Catholic tone, with Fawkes becoming a bogeyman and a pretext for Catholic repression for hundreds of years. Thankfully, that’s mostly gone now. 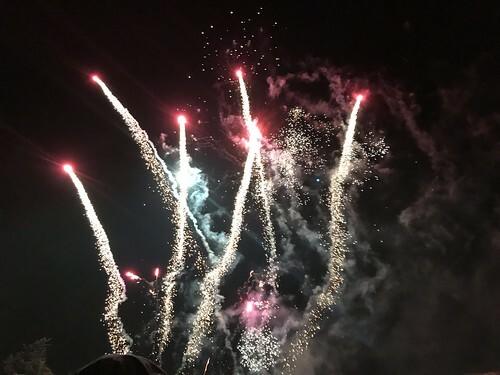 In modern tradition, the 5th of November is commemorated with a bonfire and culminates in a fireworks display, apparently to reference the “fireworks” that failed to destroy Parliament. Effigies of Guy Fawkes - complete with pilgrim style hat and ruffled collar - are processed to the site of the fire and thrown onto the pyre for burning. 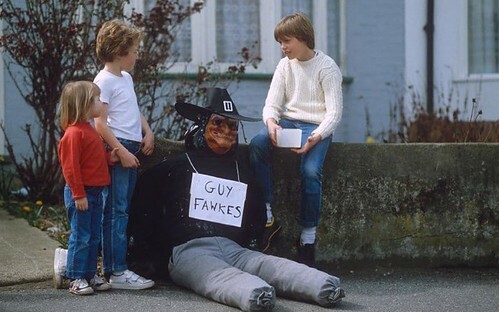 However, while a Guy Fawkes-like “Guy” may be traditional, these days any reviled public figure is fair game. Donald Trump pops up frequently, and this year Harvey Weinstein made at least one appearance. 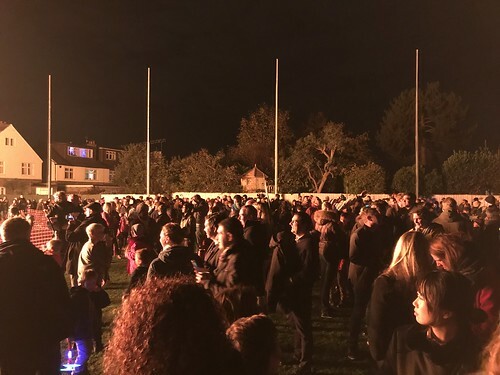 The biggest Bonfire Night events in the UK (and, therefore, the world) happen in the small town of Lewes south of London, which has six different Bonfire Societies that each hold elaborate processions of Guys and light their own fires and attracts thousands of people. So many attend that they shut down some roads and all train service to the town for the day, making it a bit of a mission to participate. 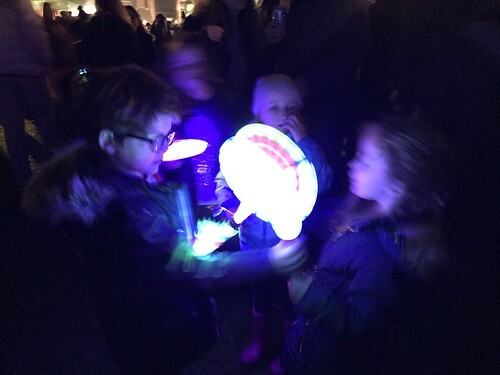 I thought it would be fun to go see Bonfire Night in Lewes, but had nothing like the level of commitment needed to travel the day before, find lodging in the over-crowded town on the busiest night of the year, and fight through the teeming throng. Instead, accompanied once again by the Intrepid Raul, I attended a very nice little community celebration in the bucolic suburb of Barnes, southwest London, which turned out to be just the right combination of tradition, size, and ease of access. 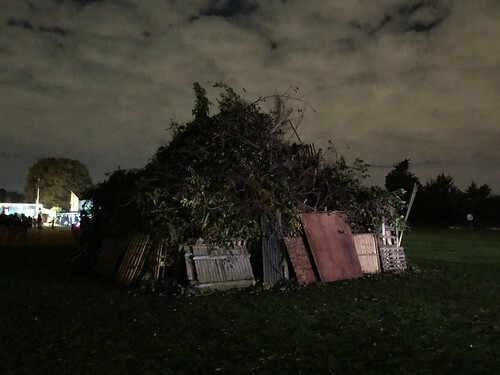 The Barnes Bonfire Night is a bit special because they actually have a bonfire. This may seem to the uninitiated like a prerequisite (the clue is in the name…) but actual bonfires are dishearteningly rare these days. Fireworks displays are a-dime-a-dozen (or perhaps I should say ten-a-penny?). Honestly, it seems like every night for the last two or three weeks I’ve been able to hear fireworks going off somewhere (this is partly because it was just Diwali, but honestly I’m so over the fireworks these days. I can hear fireworks right now as I write this.) But a bonfire? Bring it on! 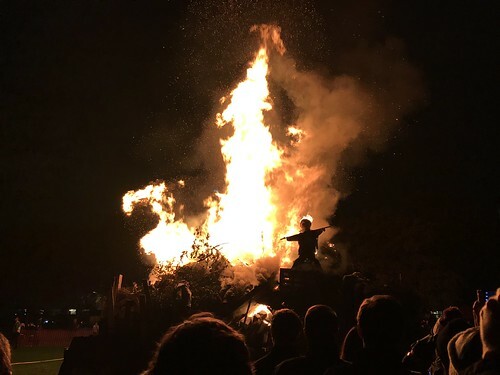 I suppose modern safety regulations make it more and more difficult to construct an enormous pile of tinder dry fuel and set it ablaze while hundreds of people stand around watching. In the days before “Elfin Safety Gone Mad” it was common for families or neighbourhoods to have their own bonfire and set off a small display of fireworks. Children would make their own Guys and parade them through the streets, soliciting donations to buy fireworks from passers-by with the phrase “A penny for the Guy?”. Raul confirms that as a child he remembers making a Guy in school and once even getting together with friends to construct and light their own bonfire. Innocent times indeed. Apparently "the penny for the Guy" tradition lasted right into the 1980s, when children were banned from buying fireworks. Now it’s mostly died out, which is too bad because it is adorably instragrammable. While it certainly wasn’t the massive all-out effort you’d get in Lewes, the Barnes Bonfire Night was just excellent. 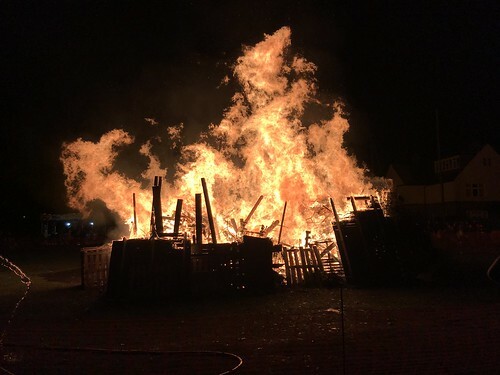 The weather was crisp enough that it felt properly autumnal, and the event was held at a community sports ground, where they’d assembled an impressive pile of fuel for the bonfire to one side of the cricket pitch. There were lots of families participating, and the whole thing had just the right home-grown vibe, with lots kids running around and overly friendly announcers on microphones with just a touch of feedback, and the season’s first mulled wine. It was, in a word, charming. Here’s the giant pile of fuel. I estimate it was about 25’ in diameter. There were also few carnival style rides and games and a couple stalls of food and drink and lots of vendors selling different light-up LED toys and sparklers. Again, sparklers are traditional, but I guess LEDs cause fewer life-changing scars, so, you know, swings and roundabouts. It was heartening to see a few sparklers at least. 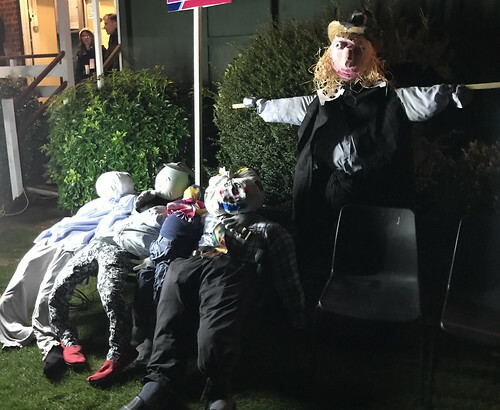 Barnes also had a contest for the best Guy - several families had made effigies and they were all set up on a park bench to be judged by a local councillor. The family who won had clearly made a real effort and their Guy, including requisite pilgrim hat with comedy-sized buckle, was quite rightly judged the winner. After the winner was declared, all the Guys were processed to the bonfire area and placed on the pile. Even better, the family who made the winning Guy were given the honour of lighting the bonfire. The Guys, including the clear winner standing literally head and shoulders above the others. The bonfire itself was bloody impressive. It was lit from a series of pyrotechnics buried in the pile and contained a lot of tree branches with dried leaves that burned ferociously at first, sending plumes of sparks into the air like an erupting volcano. There was a ring of fence surrounding the bonfire to keep people back, but the heat was so intense that people instinctively backed away more and more as the flames grew. You just couldn’t be that close. The bonfire in all its glory, with the winning Guy silhouetted against the flames. Watching a real fire is always a bit hypnotic, and the scale of this multiplied that effect. Raul and I just stood in the crowd feeling the waves of heat and the brilliant orange light and chatting and occasionally checking to make sure any outer clothing was not melting. And taking a selfie of course! Here’s the crowd, lit by the glow of the fire. It's truly the only light source in this photo. 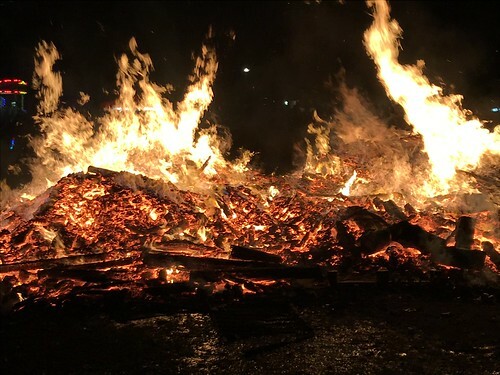 The fire went through stages - first the sparking volcano, then the intense leaping flames, then the flames died down some and you could start to see the outline of the blackened fuel in the pile, and then the heaps of glowing coals. 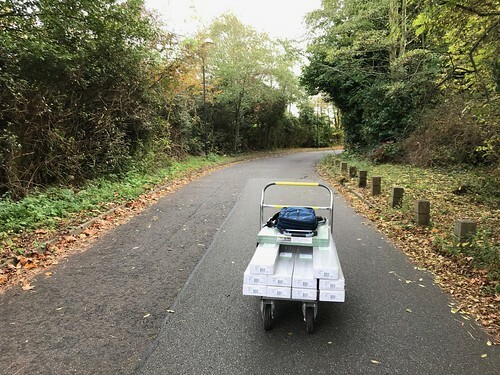 Periodically, some local committee member with a hosepipe would creep forward to spray down a patch of grass that had caught light around the periphery, though I think that the poor Barnes Sports Club cricket pitch will be quite worse for wear for some time. And of course there were also fireworks, an impressively lengthy display that we turned to watch with our right sides still baking from bonfire heat. Photos of fireworks taken on an iPhone are even worse that photos of a bonfire taken on an iPhone. And then the fireworks were done and we turned back to the fire, which had progressed to the heaps-of-coals stage. Apparently with smaller bonfires it’s traditional to put potatoes in the coals to bake. 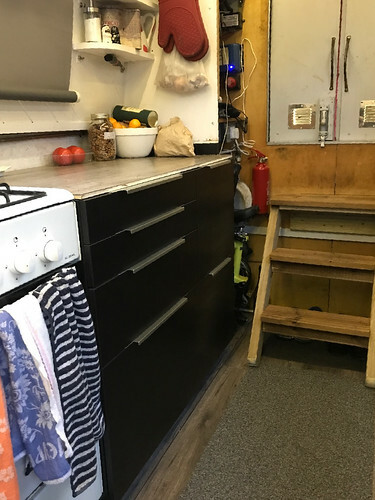 I realised that I regularly have lovely coals in my stove and tried this trick myself which did result in a potato that was basically edible, though half the skin had to be abandoned after turning into something with the consistency of a roofing tile and the colour of Donald Trump's heart. 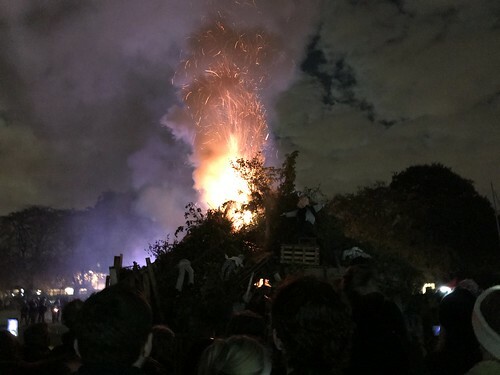 Other traditional Bonfire Night foods include Bonfire Toffee (made from black treacle) caramel apples, and gingerbread-like Parkin, none of which were in evidence in Barnes (damn). I briefly considered trying to make Parkin cake the next day, but decided to spend the time blogging instead. Lucky you. 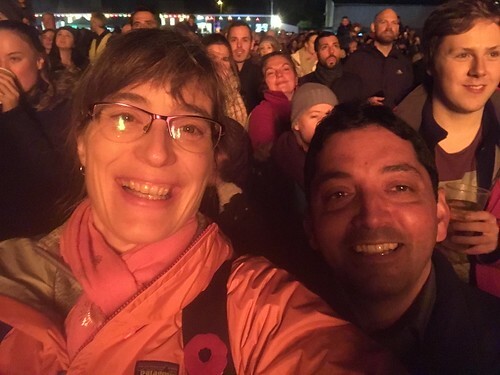 The bonfire looked set to burn on for hours longer, so Raul and I finally left the sports ground and walked along the Thames back to the station. 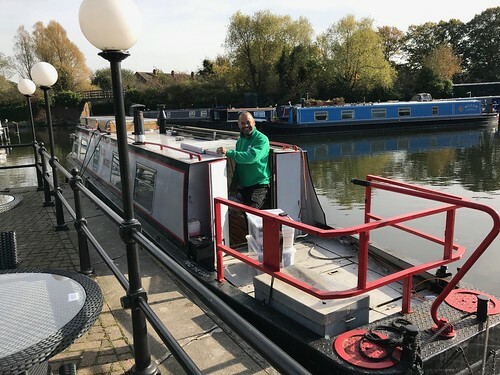 The boat is parked back at my marina mooring these days which is pleasant but about as conveniently located as the dark side of the moon so I was keen to start the long trek home. When I got there the stove seemed to be filled with the spirit of Bonfire Night, lighting easily and quickly progressing to the glowing coals stage, so I went to bed in warmth and comfort, with the smell of the bonfire in my nose and the satisfaction of finally having ticked that little item off my list. Next year: Parkin! There are a lot of things you expect to find in the suburbs of northwest London: Wembley Stadium. Ikea. The North Circular. Street after street of mostly unremarkable houses. 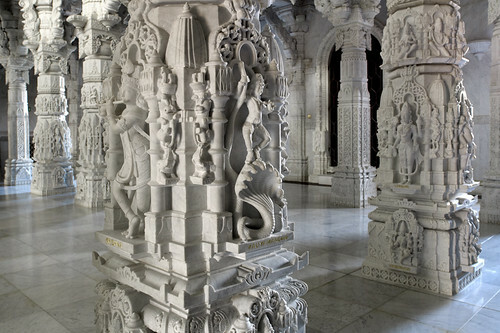 What you emphatically don’t expect to find is a huge, opulent Hindu temple made from white marble. I’d been vaguely aware of the existence of the temple, but only because I’d walked past it on the long trek to Ikea (Of course.) It’s surrounded by high walls so while might have thought, “Hmmm, that’s quite large” not much more than that really sunk in to my brain. For me to really stop and appreciate the site I needed the assistance of The Intrepid Raul who Astute Go Stay Work Play Live Readers will remember from various Bakuvian adventures, including frozen waterfalls and mountains on fire. Raul recently returned to UK soil after a three year exile contract in Azerbaijan and suggested the visit when we were catching up over a curry. I was keen on this idea partly because Raul is a pleasant companion, but also because he’s got the distinct advantage of growing up in a bi-cultural household where he might spend Sunday mornings at church then proceed to temple for the afternoon, which he claims seemed perfectly normal. 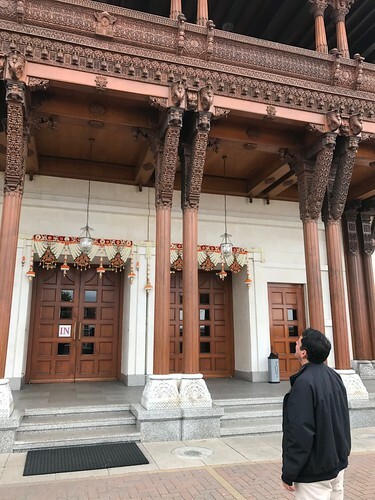 In any case, I was not going to pass up the chance to see the temple with a somewhat native guide, so we agreed to meet one Tuesday at Stonebridge Park Underground for the short walk to the site. The temple is London is remarkable for many reasons. It was, as I’ve mentioned, the first purpose-built Hindu Temple in Europe. More remarkably, it was built according to “ancient Vedic Architectural texts” meaning that no structural steel was used. The main temple building is constructed from almost 5,000 tonnes of Bulgarian limestone, Italian Carrara and Indian marble. All the stone was cut and shipped first to India, where it was hand-carved by more than 1,500 different artisans. Then each stone was numbered and carefully packed and shipped to the site in London where each of the more than 26,000 pieces was assembled. Like I said - remarkable. A close-up of some of the stone carving outside. And this is just a relatively restrained bit on the sort of “church hall” building called a Haveli, not the temple itself. 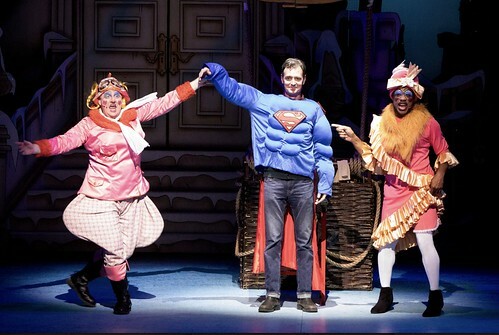 But it gets better! The construction of the temple was accomplished largely with volunteer labour. Volunteers. 3,000 of them. Assembling huge chunks of stone. And they finished the building in just 3 years. There was a quite long explanatory video in the basement museum area that showed miles of footage of the construction including lots and lots of presumably unskilled people manoeuvring 26,300 one-of-a-kind chunks of richly carved marble into position. That wasn’t a disaster waiting to happen at all. Luckily, the video didn’t mention any horrific crushing injuries or disfiguring tragedies. Not even a single shot of someone scratching their head over a plan in front of a vast field of almost identical bits of stone and shouting despairingly in Hindi something like, “Sanjay! Check that one over there! Is that 21,335 or 21,334?" Raul and I fetched up at the temple complex on a grey Tuesday afternoon, where I checked my bag across the street in a poratkabin and we went through the mandatory metal detector. First we visited the Haveli, the community centre sort of building I mentioned earlier. Raul and the Haveli from the outside. The decorations above the door were in preparation for Diwali;, the annual Hindu Festival of Light, crudely analogous with Christmas. Housing a large prayer hall, gymnasium, library, day care, office and gift shop (with all the incense you could ever need) the Haveli is also ornately carved but made mostly from English oak and sustainably harvested Burmese teak. Here's a close up of some of the carved wood on the outside. Understated it is not. Apparently for every oak tree they cut down in construction they planted ten oak saplings somewhere in Devon. Nice. 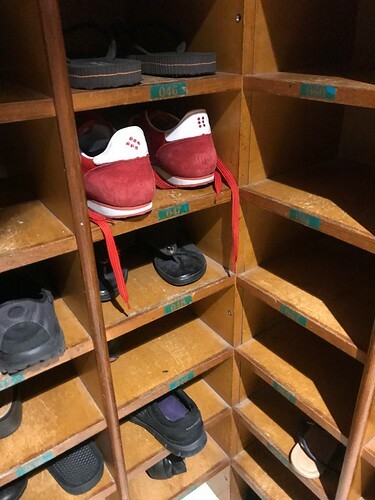 No photos are allowed inside the buildings of the temple complex, but I did manage to sneak this one after I took my shoes off, a requirement of visiting. We had a quick look around the Haveli, though the largest rooms weren’t open to the public. Then we walked the long corridor linking the Haveli with the actual Mandir. 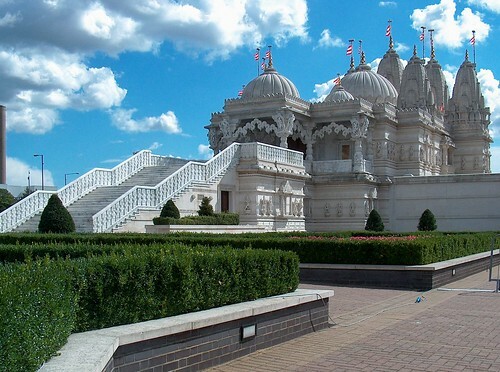 And as impressive as the mandir is from the outside, it’s much much more impressive on the inside. 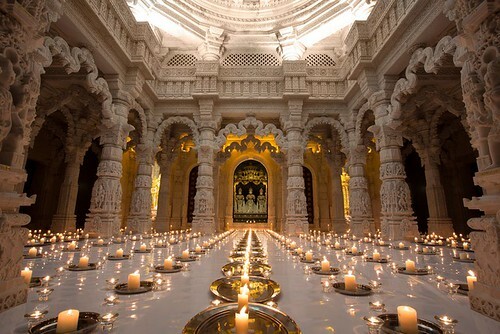 Here’s an interior picture I scooped up from Google that shows the room with candles lit for Diwali. The roof is a huge dome, supported by the columns and the serpentine supports between the columns. It really is amazing. 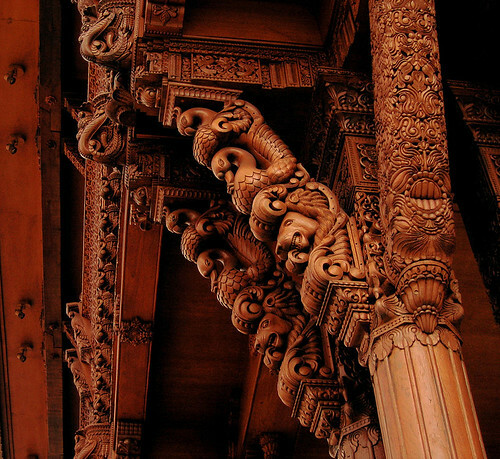 And here you can see a close up of some of the carvings on the support columns. The depth and detail is astonishing. 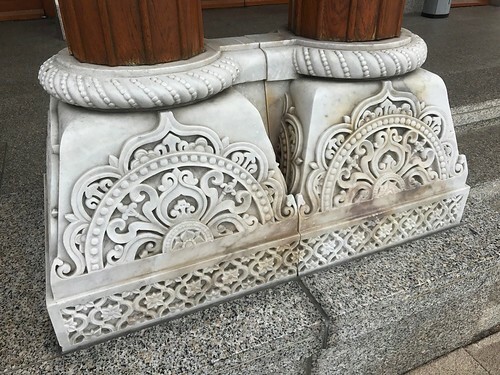 Every column is carved like this. The upper sanctum houses seven shrines that contain sacred figures of Deities that are normally hidden behind large doors. 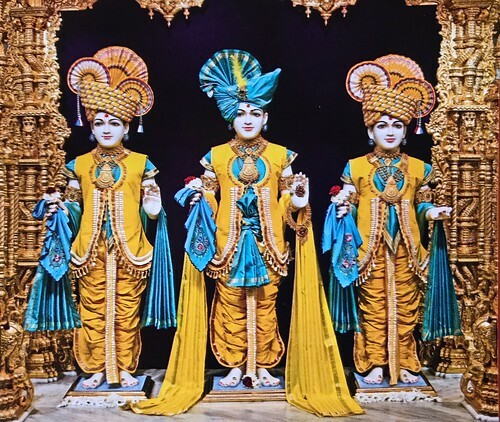 At appointed times through the day the doors are opened and the figures - called murti - are revealed so that worshippers can pray, meditate and participate in devotional ceremonies. (We didn’t see that happen, though I recall I did see this in a temple in India.) I had a lot of questions, and it would have been great to consult with Raul about the meaning and purpose of a lot of the things in the room, but there was a very strict NO TALKING policy, with a stern looking elderly gentleman there to keep order, so we just padded around quietly in our sock feet and I itched to take photos, and I didn’t. And a close up of another set of murti from the mandir. I did find one thing funny. Throughout the temple complex there were donation boxes; that’s not unusual in any religious institution. However, the BAPS gang are savvy and modern enough that they actually had contactless payment systems set up at some boxes! Want to donate at the murti of Ganesh? 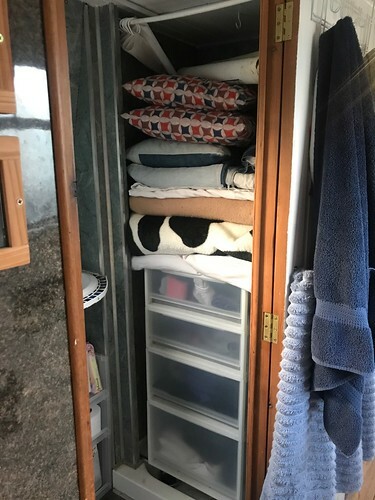 Embarrassingly out of change or small bills? No problem. Just tap your phone! 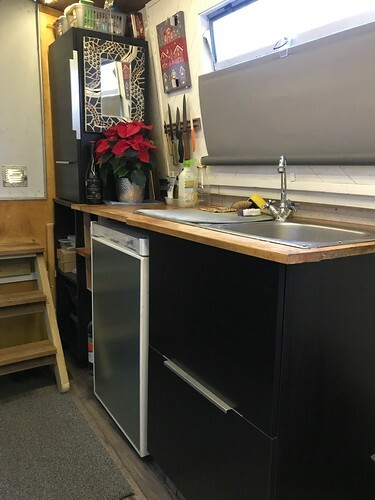 £1 per tap. For some reason I found this funny and disturbing at the same time. Once we finished in the sanctum I elected to pay £2 to visit the exhibition on Understanding Hinduism in the lower level of the mandir. This was a small but extensive and densely informative look at the history and tenets of Hinduism, and at the Swaminarayans and this mandir in particular. Hinduism is an ancient and diverse religion. I was surprised to learn that it's generally considered the oldest major religion in the world that's still practised, predating not just the Roman Empire, but even Ancient Egypt. Sanskrit, the primary language of Hinduism, is the oldest Indo-European language, and Hinduism claims the world's first university (from 700 BC, a teaching subjects as diverse as logic, grammar, medicine, astronomy, commerce, music and dance). The exhibit also credits Hinduism, or ancient Indian culture in general, with inventing the zero, geometry, and the Pythagorean Theorem (before Pythagorus), and with discovering the heliocentric nature of the solar system and gravity, and developing plastic surgery. Busy beavers. 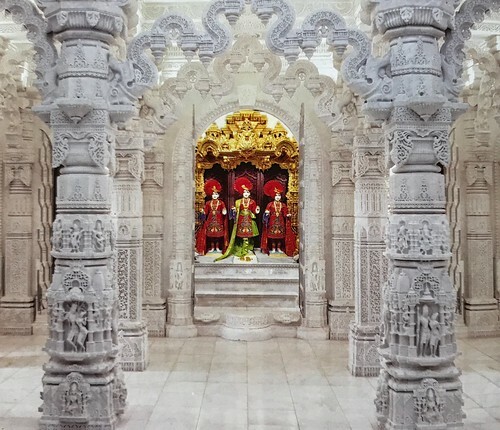 The Swaminarayan Mandir really is remarkable. Raul and my visit was not long, but the whole time I kept hearing him muttering, "You could be in India." It was a bit like someone had lifted up the Great Pyramid at Cheops and settled it gently in a carpark in Swindon. Coming back out into the grey Tuesdayness of north London after visiting was a bit of a shock. Which made my next destination all the more jarring. Where did I go? After being deeply immersed in ancient eastern culture and architectural wonder?